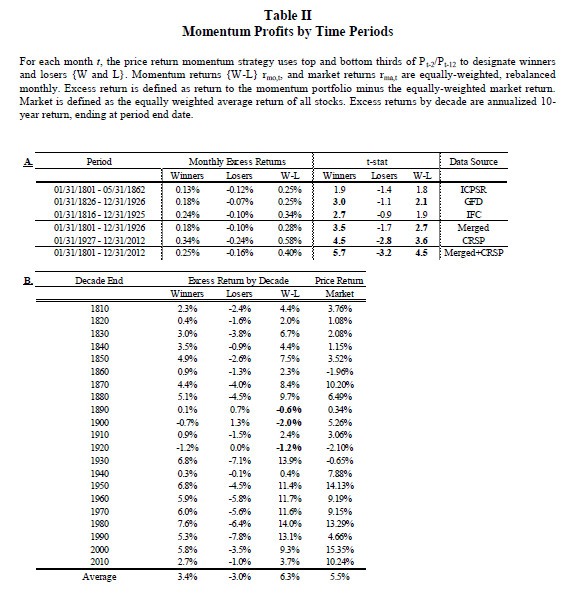 In the words of Asness et al (2014), “No other factor…has nearly as long a track record, as much out-of-sample evidence (including across time, geography and even security type), or as strong and reliable a return premium as momentum.” They were speaking only of relative strength momentum. When you add in absolute momentum, which has shown the ability to further boost returns as well as decrease bear market risk exposure, you have to wonder why many more investors are not enthusiastic about momentum. This is especially surprising since the stock market has twice experienced 50% losses during the past 15 years and is back in a precarious position again. We have seen others characterize momentum as a shorter-term moving average approach or something based on daily price changes. But momentum is a well-documented intermediate term anomaly effective over a 3 to 12 month look back period. For stocks, longer (3 to 5 years) and shorter periods (1 month or less) are mean reverting, which means they perform the opposite of momentum. Daily price changes are just noise with little or no serial correlation. We think there is more to the lack of interest in momentum than just incorrect information. Some investors diligently search for reasons, real or imagined, to reject, criticize, ignore, or misrepresent momentum. Why is this? Here are some possible explanations gleaned from my discussions with others, online reviews of my book, and some internet articles about momentum. Reason #1: I have done a lousy job explaining momentum. In my book and blog posts you will find references to many momentum research studies you can download for free. Wading through these may seem like a daunting task and, to quote Yogi Berra, “If people won’t come to the ballpark, how are you going to stop them?” But you can gain considerable insight from reading just the papers’ abstracts, conclusions, and exhibits. Momentum is not as complicated as you might think. In fact, one of the main attractions of momentum is its simplicity. Reason #2: Momentum is too simple. Some people wonder how an approach this simple can be so good. Momentum has even been called a trivial strategy, but its results are hardly trivial. Simple is good, since it means less chance of overfitting the data. Synergy happens when you combine simple absolute momentum with simple relative momentum. Over the long run, relative momentum offsets the underperformance of absolute momentum in bull markets. Absolute momentum, unlike relative momentum, can side step severe bear market drawdowns. This complementary combination can boost profits while also reducing bear market risk exposure. Our last blog post, “Why Does Dual Momentum Outperform”, shows how relative and absolute momentum work together synergistically to create the whole of dual momentum that is greater than the sum of its parts. We also opt for simplicity by using a simple stock and bond portfolio. Because of the drawdown reducing benefit of absolute momentum, dual momentum does not need to diversify into a large number of assets to reduce portfolio risk. The post receiving the most views on my blog is the one about our dual momentum sector rotation model. People seem attracted to approaches with more “moving parts,” even though, as in this case, complex models are often no better than simpler ones with fewer parameters. Frederic Chopin called simplicity “the final achievement,” and Leonardo da Vinci called it the "final achievement." I recently gave a presentation in Florida where the sponsoring chairperson said he initially dismissed my book because the approach in it looked too simple. After he back tested the strategy himself and saw how strong and robust it was, he became an enthusiastic supporter of dual momentum. Reason #3: Momentum is hard to get your head around. We all love a good story, and momentum is not a good “once upon a time” concept. Most of us understand the principle behind value investing. We buy what is “cheap”. The concept of value is widely accepted throughout the investment industry. 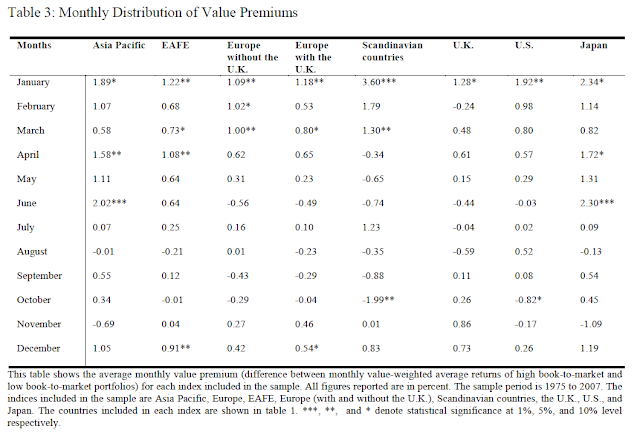 Yet Israel and Moskowitz (2012), using book-to-market and other common value criteria, show that “the value premium is largely concentrated among only small stocks (microcaps) and is insignificant among the two largest quintiles.” Because of liquidity and cost issues, hardly anyone invests in microcaps. Other studies show that value works with large stocks but only during January. The following table from Das and Rao (2012) illustrates this point. Value investing is also subject to sustained tracking error (six straight years of under performance in the 1990s), larger drawdowns than the broad market, and value traps where cheap companies can become much cheaper. The energy and mining stocks are showing us that now. They appeared inexpensive over the past few years, but no one accounted for the dramatic drop in the future value of their assets. Value investing is still quite popular because investors like the idea of buying what may be cheap. But investors forget (or never realized in the first place) that stocks may be cheap because their risks may be high. With momentum investing, instead of buying what is cheap, we buy what has appreciated. Buying strength goes against human psychology. In fact, the disposition effect makes us want to sell recent winners rather than buy them. It goes against the maxim first uttered in the early 1800s, “cut short your losses and let your profits run on.” The behavioral heuristics of anchoring and conservatism can also create inertia keeping us from buying momentum winners. Reason #4: You cannot trust back tested results. Like the Wizard of Oz witches, there can be good back tests and bad back tests. Practitioners often prefer complicated models. They may search for the best ex-ante assets, parameters, or filters without considering if their logic makes sense, how consistent their results are over time, and what the impact is of transaction costs. They tend to use limited amounts of data, over optimize their model parameters, and overfit the data. This kind of back testing usually does not hold up well ex-post, and it is good to be skeptical of it. Academic trained researchers, however, prefer simple (parsimonious) models, and they apply them to as much data as possible. They then look to verify promising models on out-of-sample data whenever it becomes available. Trained researchers also give importance to robustness. They prefer models that hold up over a range of parameter values and when applied to other non-correlated markets. We see impressive consistency over the past 21 decades across all asset classes. The authors also confirm the efficacy of absolute momentum over the 210 year period. Momentum is not just a good fit to the data that has survived over 200 out-of-sample tests. There are some deep seated behaviorally-based reasons that can explain why momentum has performed well and has a good chance of continuing to perform well. Reason #5: Momentum is not diversified. Relative strength momentum could not exist without diversification. Relative strength requires multiple assets to compare and choose from. You can think of momentum as vertical rather than horizontal diversification. It diversifies across time rather than across assets to better exploit market strength and avoid the performance drag that comes from always holding lower risk premium assets. The U.S. stock market has the highest long-run risk premium, and that is why we use it as our core dual momentum asset. This gives us a logical reason rather than one based on data mining. We look for the highest risk premium, then manage that risk. We hold short term bonds when stocks are weak and it makes the most sense to be in fixed income. Reason #6: Momentum conflicts with strongly-held prior beliefs. Beliefs can have a powerful influence on how we perceive new information. Familiarity bias keeps many away from momentum. Confirmation bias can cause investors to reject momentum if they perceive momentum as being the opposite of value investing. Then there is the buy-and-hold Borg (“resistance is futile; you will be absorbed”) that rejects any approach trying to beat the market. Dual momentum may experience extra prejudice since it includes trend-following absolute momentum that may seem like voodoo to those taught that you cannot successfully adapt to changing market conditions. Andrew Lo and other academics have now demonstrated that this is not always true. 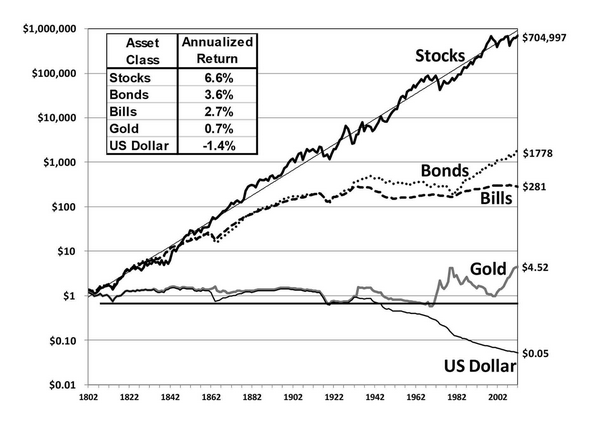 Trend following with stocks has been shown to be effective all the way back to the 1700s. According to Greyserman and Kaminski (2014), equities with trend following showed a higher Sharpe ratio, reduced downside exposure, and gave nearly a 3% greater annual return than buy-and-hold from 1695 through 2013. No investment approach is perfect, and dual momentum will at times underperform its benchmark when looking at incomplete market cycles . Its absolute momentum component can be subject to whipsaws, especially during bull markets . Career risk can be a significant factor among investment professionals who fear tracking error and deviations from investing norms. Reason #7: Momentum outperformance may not last. Stocks and bonds may return less in the days ahead. But then most other investment portfolios would also show lower returns. Momentum has outperformed from at least the 1800s. Anything can happen in the investment world, and momentum could lose some of its luster. But if you want to play stump the critic, ask them why they think momentum outperformance is unlikely to continue. You may guess the sun will stop rising in the East some day, but past evidence is against it. I have not yet heard a credible reason on what would cause the sun to suddenly change direction. Behavioral factors are unlikely to change, and limits to arbitrage (career risk) work against momentum naysayers. Reason #8: Momentum may attract too much interest which will ruin it. Anomalies can lose their effectiveness if too many people get on board. This may be particularly true for an approach like dual momentum that offers both higher expected returns and lower risk exposure. But investors have known about the momentum anomaly for more than 20 years, and there has been no degradation in its out-of-sample performance, despite blog posts saying otherwise. Over the past 15 years, the Sharpe ratio of the top one-third value-weighted momentum deciles of U.S. stocks was 0.41, compared to 0.15 for the bottom one-third deciles . Research has shown that stock momentum has earned twice the annualized return premium as value since 1927. Despite this, momentum investing has not attracted anywhere near the amount of interest that value investing has. Value is used more than momentum in multi-factor funds. The word “value” is found over 130 times more often than the word “momentum” in the names of all U.S. mutual funds and ETFs. Since most momentum research deals with individual stocks, momentum is most commonly used with portfolios of individual stocks. Focused stock portfolios may someday have capacity issues if interest in momentum continues to grow. But we use broad market indices with dual momentum, and these are much more scalable than individual stocks. Frictional costs are also substantially less. 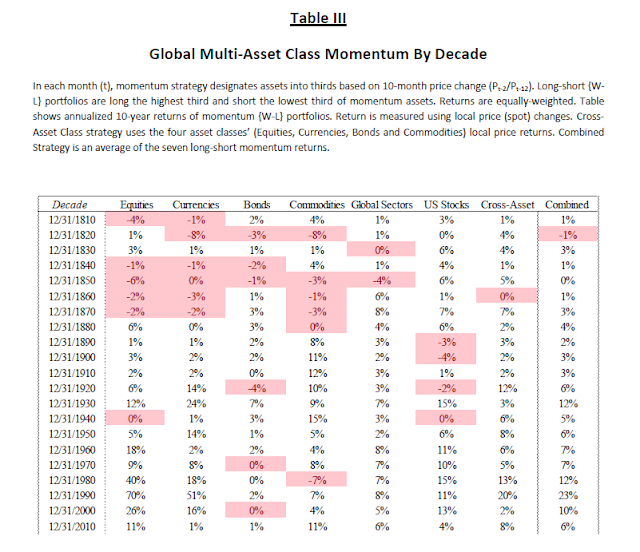 Our Global Equities Momentum (GEM) model averages only 1.3 trades per year. There is much less interest in absolute or dual momentum than in relative momentum because many still refuse to accept trend following. This gives our dual momentum approach even more scalability. For abnormal profits to be arbitraged away, investors need to behave rationally, and momentum profits are most likely due to investor irrationality. Reason #9: If momentum is so good, why hasn’t it attracted more interest, especially from institutional investors? There are innumerable value, buy-and-hold, and other investors whose biases keep them from being receptive to momentum. This is especially true of institutional investors. Institutional constraints keep most institutional investors away from all types of momentum. Career risk associated with tracking error, long-standing aversion to trend following, and confirmation bias are disincentives that keep institutional investors away from dual momentum. Without their participation, it is unlikely momentum will be over exploited. 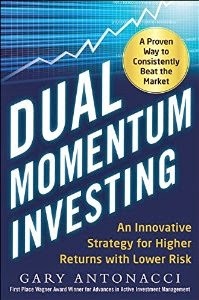 The reasons that keep investors from accepting and using dual momentum are the same reasons that should keep it from ever becoming too popular . There are risk factors and challenges associated with momentum investing. These include the possibilities of whipsaw, lags in stock market re-entries, and other forms of tracking error. Risk premiums may also change over time, but this is not a potential issue limited to just momentum. Momentum can also be challenging to use, since its signals may run counter to our emotional inclinations. But the aversion some have to momentum has little to do with these risk factors. The behavioral biases that keep investors away from momentum investing are the same ones that cause momentum to work in the first place. These include conservatism, confirmation bias, and anchoring that prevent us from accepting something new or unfamiliar. Other influencing biases are herding and overconfidence by those who are committed to alternative investment approaches . It should come as no surprise that the same irrationality causing momentum to work in the first place also keeps investors from accepting and using it. Behavioral economists have long shown that people are irrational. And that’s all people, not just my ex-wife. For those who can overcome their behavioral biases and prejudices, may the momentum force be with you. 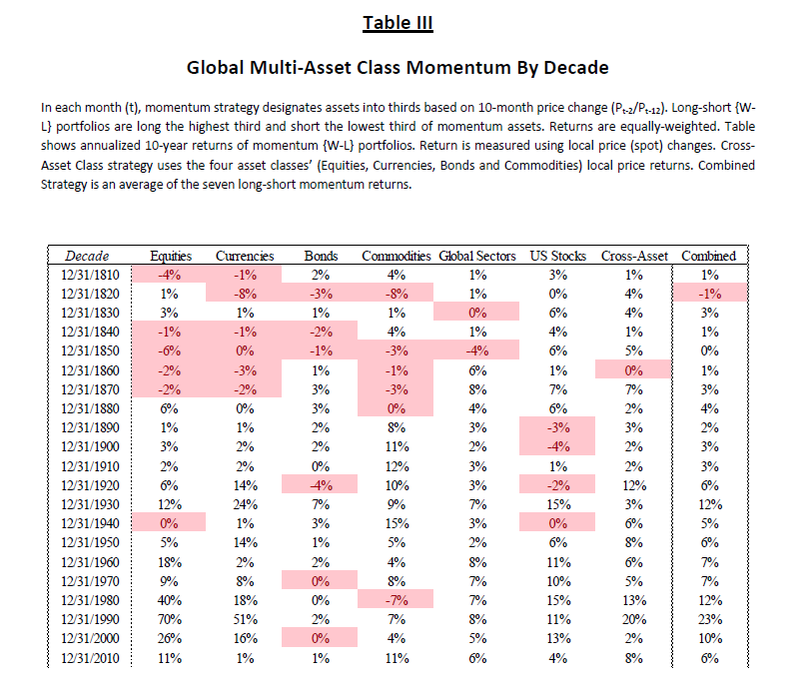 Dual momentum underperformed its benchmark in 1979-80 and 2009-11. 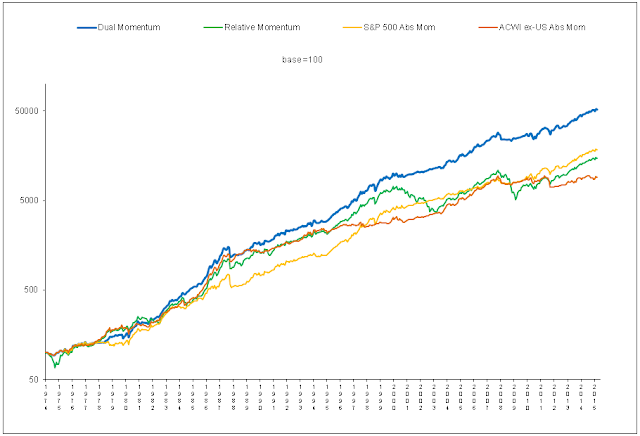 Since 1971, our Global Equities Momentum model exited and reentered stocks 9 times within 3 months. During this same period, the popular 10-month moving average exited and reentered stocks 20 times. See Israel and Moskowitz (2012) for more evidence of continuing momentum outperformance. See Sheifer and Vishny (1997) for more on the limits of arbitrage. For an introduction to behavioral biases, see "Are You Trying Too Hard: The Case for Systematic Decision Making" by Alpha Architect.